The weatherproof fire door holder is designed to hold open fire doors for convenient access through busy doorways and release the door to close when an alarm is triggered. 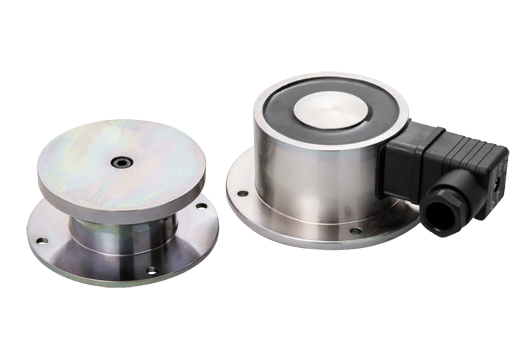 Designed for wall mounting, the weatherproof fire door holder is supplied complete with a keeper plate for fixing to the fire door. Both parts are constructed from steel and are zinc plated. The strong construction makes this magnet ideal for most applications in all types of building. The high level of ingress protection also means that this magnet is particularly suited to use outdoors and in maritime applications. Electrical connection is via an IP65 connector supplied with the magnet. A wide range of AC and DC voltages are available to order. SG Transmission, our sister company also designs and manufactures a wide range of customised clutches, brakes and holding magnets.